For most analysts, the pace of analytics and data science can be frustrating. The common waterfall approach works well for the fixed reports, but it can be a lengthy process to request additional data sets, create new reports, or serve new use cases. So it’s no surprise that organizations are looking to shift towards a self-service model, empowering business users to discover and iterate quickly. However, it’s not just about opening up this access, but also ensuring the results are accurate and trusted. When there are petabytes of data, how does a user know which tables to use and which are most relevant? How do you strike the balance between discovery and agility, while still meeting enterprise governance standards to truly get more value from your data? In addition, we will walk through best practices and considerations when developing your organizational strategy around self-service analytics, and highlight several real-world success stories from a wide range of industries. Cloudera DataFlow (CDF) is a scalable, real-time streaming data platform that collects, curates, and analyzes data so enterprises can gain key insights for immediate actionable intelligence. CDF addresses some of the key use cases of an enterprise from data ingestion, stream processing to real-time streaming analytics. With the recent merger with Hortonworks, the new Cloudera has emerged as an Enterprise Data Cloud company with a vision that spans from the Edge to AI. Since its introduction in 2017, Cloudera Data Science Workbench (CDSW) has enabled hundreds of enterprise customers to adopt and scale the modern machine learning workflow, accelerating the delivery of new machine learning capabilities for business, from research to production. Now that Cloudera and Hortonworks have merged, Cloudera is rapidly delivering CDSW for use with HDP clusters in order to make secure, collaborative data science at scale a reality for our new customers. ●How IT teams support self-service data science at scale with CDSW’s enterprise-grade management, security and governance features. We’ll include a live demonstration of a machine learning workflow using CDSW for HDP. Machine learning and artificial intelligence are exciting technologies, but success means excitement about business outcomes, not technology. Could success make AI boring? In a world where hundreds or thousands of automations are rapidly and repeatedly deployed, operating silently across a business, we imagine today's hype around these technologies dying altogether - as with electricity before them. Cloudera Enterprise 6.0 is now available and provides a major upgrade to our modern platform for machine learning and analytics with significant advances in productivity and enterprise quality. We have tuned compute resources to maximize performance and minimize total cost of ownership (TCO). We also updated and tightly integrated a range of open-source projects including Apache Spark for data science, Apache Kafka for streaming data pipelines, and Apache Solr for search. Scalability, security, governance, and management capabilities have all been enhanced to provide the safest and easiest enterprise-grade platform to power multi-disciplinary analytics for your business in the cloud or on-premises. Machine learning is all about the data, but it's often out of reach for analytics teams working at scale. Cloudera customers such as Wargaming.net can store, process and analyse 550 million events each day to help them improve gamers’ experiences and increase their customer lifetime value. Whether you are new to machine learning and advanced analytics, or you already take advantage of the possibilities, this session will explore practical examples and give you some new ideas to take away. Discover how enterprise organisations can accelerate machine learning from exploration to production by empowering their data scientists with R, Python, Spark and more in one unified platform. 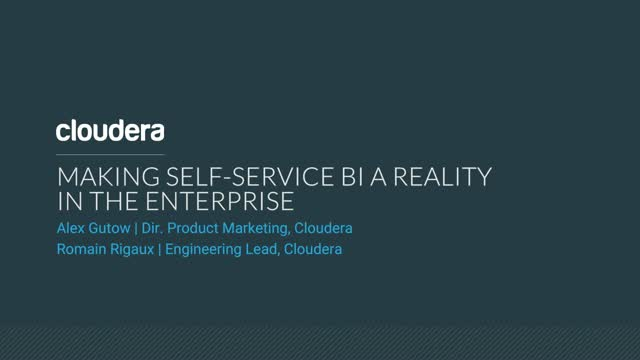 At Cloudera, we believe that data can make what is impossible today, possible tomorrow. We empower people to transform complex data into clear and actionable insights. We deliver the modern platform for machine learning and analytics optimized for the cloud. The world's largest enterprises trust Cloudera to help solve their most challenging business problems.